by Richard Andrew Hall, Ph.D.
Standard Disclaimer: All statements of fact, opinion, or analysis expressed are those of the author and do not reflect the official positions or views of the Central Intelligence Agency (CIA) or any other U.S. Government agency. Nothing in the contents should be construed as asserting or implying U.S. Government authentication of information or CIA endorsement of the author’s views. This material has been reviewed by CIA to prevent the disclosure of classified information. I am an intelligence analyst for the Central Intelligence Agency. I have been a CIA analyst since 2000. Prior to that time, I had no association with CIA outside of the application process. “LOST”…DURING INVESTIGATION: WHEN ABSENCE OF EVIDENCE IS NOT EVIDENCE OF ABSENCE. From early in 1990, those who participated in or were directly affected by the December 1989 events have attested to efforts to cover-up what happened. Significantly, and enhancing the credibility of these accusations, those who claim such things come from diverse backgrounds, different cities, and from across the post-Ceausescu political spectrum. Further enhancing their credibility, in many cases, they do not attempt to place these incidents into larger narratives about what happened in December 1989, but merely note it as a fact in relating their own personal experiences. –If I talk. Or if I have a copy of the file that I removed on 22 December 1989 from the office of the head of the county Securitate. There was a map of the 8 Interior Ministry formations from Timisoara and “registry-journal of unique ordered operational activities.” I gave them to Constantin Grecu (since transferred to the reserves), who gave them to Colonel Zeca and General Gheorghe Popescu. These documents were of great use…in the Army’s fight against the terrorists. –Do you know what the deal is with such formations?…When I looked at the map, my eyes glazed over. Their formations were for entire zones where 10 to 12 nests of gunfire were programmed to shoot at a precise hour and minute! Can you imagine! And I, because I was trying to help in the fight against the terrorists, I turned it over to them! So now I asked for it to be used at the trial. In the registry everything was written: who ordered, who executed the mission, the place, the hour, how long it last, the impact. Great, all these documents are now said to have disappeared. And I am threatened that I too will disappear like them. The discovery and then disappearances of such maps showing the placement and actions of Interior Ministry units—in particular, the Securitate—was recounted by others in the early 1990s. I had two encounters with representatives from the prosecutor’s office. The first prosecutor visited me at home, around two months after the events, he listened and noted my account, and as a conclusion, informally, he said something to me such as “we already know a good part of the shooters, they can be charged and pay civil damages, you can be part of the lawsuit and request appropriate damages.” After hesitating, I added such a request, at the end of my written declaration, which I signed…. The second prosecutor, who later came to head the institution [the procuracy], invited me after several months to the office near Rosetti Square. At the end of the conversation, he attempted to convince me that we shot amongst ourselves [ie there was no real enemy, no terrorists]. Florin Crisbasan: Now the securisti are spreading their version: “You guys shot into one another like a bunch of idiots.”…About 100 people were arrested as terrorists, but now they tell us they no longer have them…documents are missing, they don’t know how or what type: a video cassette that I wished to access, with film from the events, can no longer be found…. Emil Ivascu: If they tell us that “we shot among ourselves,” how the hell do you explain the ammunition with which they [the terrorists] fired? A bullet would rip your foot apart. We saw for ourselves these type of arms. Could just average civilians have been in possession of these? In May 1991, Gheorghe Balasa and Radu Minea described in detail for journalist Dan Badea the atypical ammunitions they found in the headquarters of the Securitate’s Vth Directorate (charged with Ceausescu’s personal security) building, including dum-dum bullets and special bullets (apparently vidia bullets). They noted the civilians and soldiers who had witnessed this find, and mentioned that a certain Spiru Zeres had filmed the whole sequence, cassettes that were available for the military procuracy. In December ’89, after he arrived from Timisoara, my father stayed with me on Stefan Cel Mare Boulevard [in Bucharest]. We returned to our home, on the corner of Admiral Balescu and Rosenthal. I found the cupboard of the dresser pure and simple riddled with bullets, about 8 to 10 of them. Someone who knew about such things told me they were vidia bullets. They were brought to a commission, but I don’t know what happened to them. The origin of this phrase is apparently ascribed to the astronomer and scientist Carl Sagan, and only later became a favorite of former US Secretary of Defense Donald Rumsfeld. Radu Ciobotea, “Spitalul groazei nu are amintiri,” Flacara, nr. 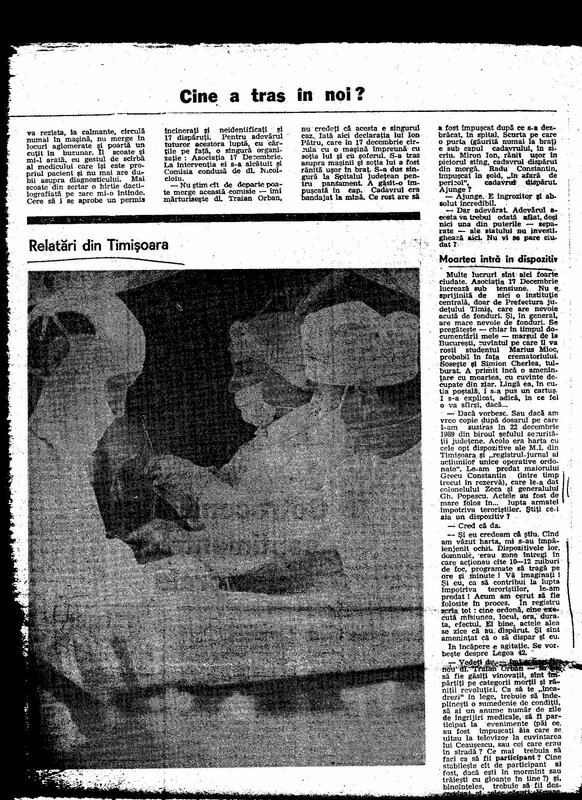 19 (8 mai 1991), p. 4. See the sources listed in endnote 59, Hall 2006.
 http://romuluscristea.wordpress.com/2009/04/21/cautari-dupa-20-de-ani/#more-2603 It would be interesting to say the least to know who the second prosecutor was, although I have my suspicions as to who it could have been. Mircea Florin Sandru, “Brasov: Intrebari care asteapta raspuns (II),” Tineretul Liber, 17 ianuarie 1990, p. 1, p. III-a). I discussed all of this in detail, including a partial English translation of the article, in Hall 2008. Christian Levant, “Dacă tata nu-l salva pe Tokes, dacă nu salva biserici, tot se întâmpla ceva,” Adevarul, 30 September 2006, online at http://www.adevarul.ro/articole/dac-x103-tata-nu-l-salva-pe-tokes-dac-x103-nu-salva-biserici-tot-se-nt-mpla-ceva/200090. Army Colonel Ion Stoleru with Mihai Galatanu, “Din Celebra Galerie a Teroristilor,” Expres, no. 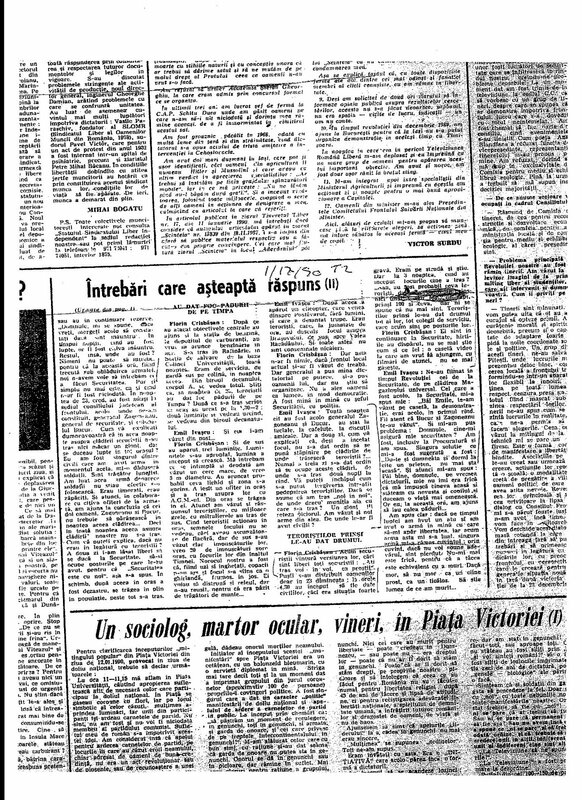 151 (22-28 December 1992), p. 4, and “Am vazut trei morti suspecti cu fata intoarsa spre caldarim,” Flacara, no. 29 (22 July 1992), p. 7. Cited in Hall, 2008. Rasvan Popescu, “Patru gloante dintr-o tragedie,” Expres, nr. 32 (81) 13-19 August 1991, p. 10 (?). This entry was posted on October 24, 2010 at 10:00 pm	and is filed under raport final, Uncategorized. Tagged: brasov decembrie 1989, bucuresti decembrie 1989, dan badea, decembrie 1989, Dr. Nicolae Constantinescu, jean constantinescu, maria petrascu, nicolae ceausescu 1989, Radu Ciobotea, romulus cristea, securitate december 1989, Simion Cherla, Spiru Zeres film, teroristii din 1989, timisoara decembrie 1989. You can follow any responses to this entry through the RSS 2.0 feed. You can leave a response, or trackback from your own site.